Football Star is a 5-reels with 243 ways to win video slot created by Microgaming. As its name already suggest it, this slot machine has a football inspired theme with related symbols and graphics. 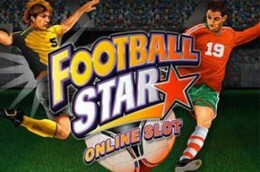 Football Star offers wilds, free spins features and cash prizes. The main symbols are theme-related and they includes football boots, a football pitch, a referee and five players. The wild symbol is the game’s logo, while the scatter symbol is a flying ball.